You only have to glance around at a local parkrun, race or the gym to realise that, contrary to popular belief, running is not a free sport. Specialist shoes, technical kit, race entry fees and the technology to enhance training all require you to spend money. In some cases, that appears to be a vast amount of money. In the world of trail running, where keeping yourself safe in an often harsh environment is key, the costs can mount up even more. With a little forethought and planning, however, running off-road on a tight budget is quite possible. Prioritising is key, so here are some ideas to help you decide where to spend the limited money you have. Running shoes need to be top of your shopping list; if you don’t get these right, your adventures on the trails will be short-lived. Start by deciding what kind of terrain you’ll be running on, and target your shoe search accordingly. If you’ll be running on a wide variety of off-road surfaces, look for an all-round trail shoe. If your running will be entirely on rocky mountains, research which shoes will do the job. Once you have narrowed down exactly what you are looking for, start your bargain hunt. Great places to look are independent running shops or online retailers, who often have last year’s models at knock down prices. 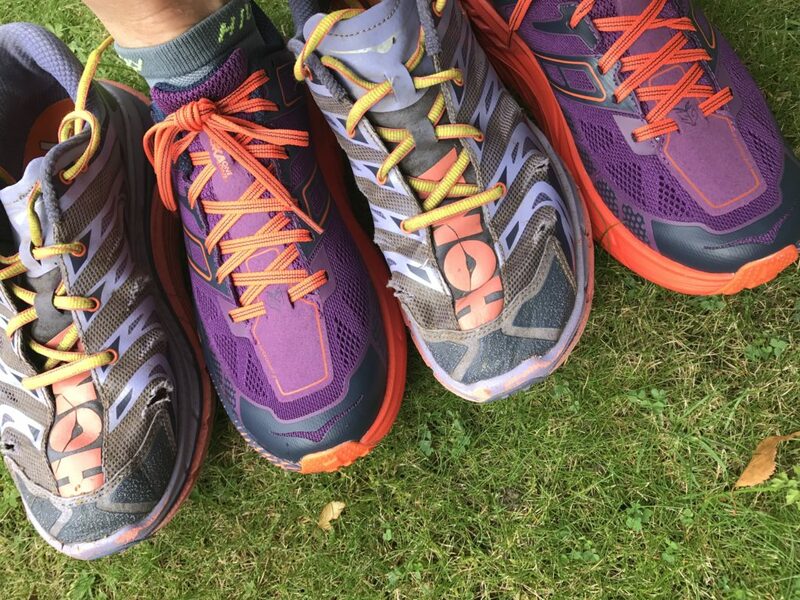 If you’re happy to buy hardly-worn shoes, then eBay and the Facebook selling groups (such as Running Gear Buy and Sell) usually have some great bargains to be had. For running off-road, where your feet will most likely get wet, muddy and cold, socks come after shoes in spending priorities. Look for synthetic, wicking fabrics, or wool when choosing. Again, both running shops and online stores will have great deals, especially as the seasons change. Look for end-of-range bargains, and multipacks. If you’re a woman, spend money on a well-fitting, supportive sports bra as a priority. As well as running stores, eBay and social media selling groups, department stores can often have some real bargains at sale time. As you start to enter races, you’ll notice that many will specify a waterproof jacket (and trousers) with taped seams. The top of the range models can cost a fortune, but less breathable waterproofs can be found for less than £20 at stores such as Decathlon and Millets. They'll keep the rain out, although you might still get a little damp and sweaty on the inside. For t-shirts, shorts, tights, base layers and so on, synthetic fabrics are the way to go, as they wick away sweat. If you own kit from another sport, that can often be useful to run in. If you need to buy, then in addition to online bargains and reduced items in shop sales, some supermarkets have excellent ranges, for example Lidl and Aldi. They stock running kit a couple of times a year as part of their special offers. It’s cheap to buy and great quality, and therefore tends to sell out quickly, so keep an eye open for their offer weeks. If you have the time and some running friends, organising a running clothes-swap can be a great way of topping up your kit. As you head out further onto the trails, you’ll start to need to carry fluids and food. Everywhere that sells bargain clothing also tends to sell reasonably priced hydration packs, waist packs, bottles and so on. Bargain headtorches can be found in many outdoor stores, including Alpkit, who are well known for their good quality lighting. Do check how powerful a bargain headtorch is, though. A weak beam in the dark can lead to problems. If you’re happy to train alone, or with friends, then training is free. Some support and guidance can be found for no cost; there’s a wealth of information online for starters. You just need to work out what is good quality advice and what is not. If you’d like some more structured, face-to-face support, seek out some of the many free or low-cost running groups out there. The Run Together website will list some near you. 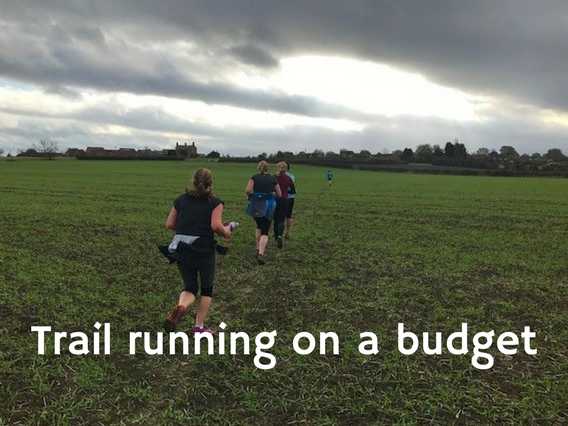 Joining a club can also be great value for money, with both running friends and coaches on tap, and quite often entry to some events included too. You can save money by looking after your body when training as well. Including rest and recovery in your plans, and warming-up and stretching in your routine, will help you avoid injury and thus physio costs too. There’s a lot to be said for running with your basic stopwatch; it will focus you on running to feel and the terrain around you, rather than pace and distance. If you really want to know how fast you are running and how far, there are plenty of free apps for your phone that do the job, for example Strava. Just download and off you go. You certainly don't need to spend money on an elaborate watch. It can be tempting to race often, and to enter pretty much every event that you fancy. To save money, and target your training more effectively, plan your race season in advance. Pick a few key events at most and look for those with lower entry fees. Races organised by running clubs tend to cost less than those run by businesses, and fell races are almost always a real bargain. If you can’t afford to race at all, then parkrun is free. If you join a running club, you'll gain free entry to cross-country events. No matter where you live and run, adventure does not need to be paid for. Keep your eye out for local footpath signs and see where they go; look at a local map online and plan a route over unfamiliar ground. With a little time, research and creativity, you can set yourself up for trail running with minimal spend. Keep your eyes open for bargains, sales and special offers and you will be rewarded. Enjoy exploring your local trails knowing that it's all cost you very little indeed. The beautiful Nottinghamshire, Lincolnshire and Leicestershire areas play host to a wide range of trail races all year round. There is something for everyone on the list, from 5K routes to ultras and from easy forest trails to muddier, hillier challenges. Whether you're choosing your first trail race or looking for a new challenge, there'll be something to suit you. 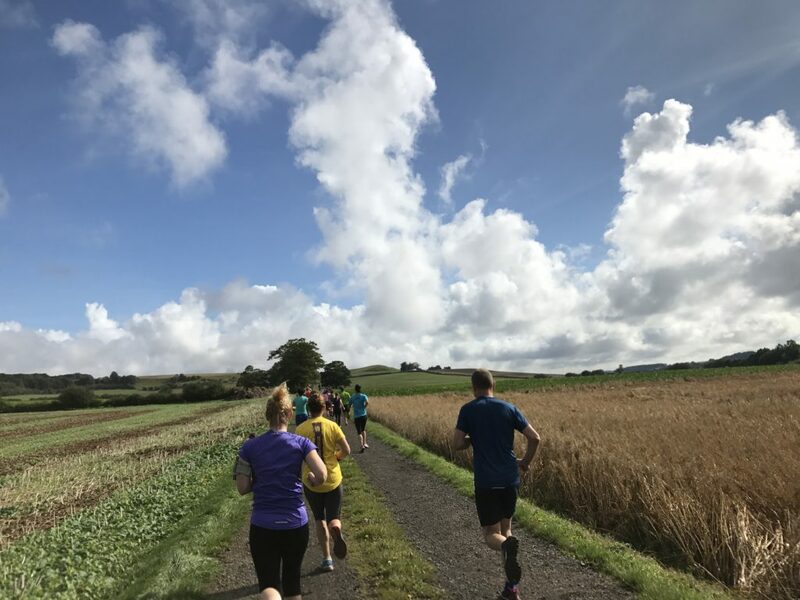 Belton House parkrun (5K) – a flat, two-lap course on tracks, paths and grass in the grounds of the National Trust’s stunning Belton House near Grantham. Bestwood Village parkrun (5K) - a hilly, one-lap course on woodland tracks and paths. Can be very wet and muddy in winter. Challenging! 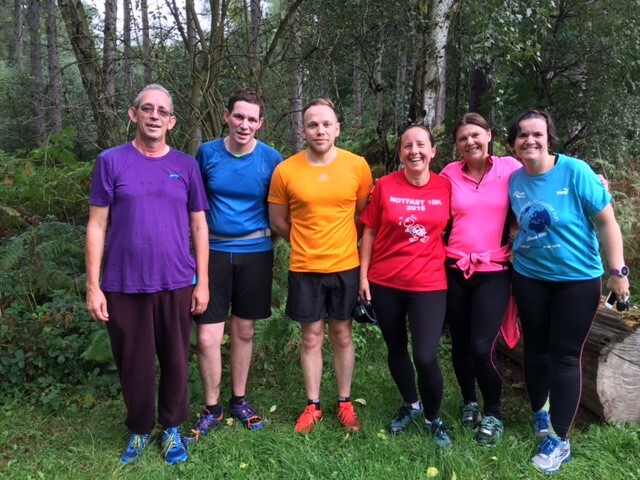 Clumber Park parkrun (5K) – a gently undulating, two-lap course on stony tracks and woodland paths in the beautiful Clumber Park. Can be wet and muddy in winter. Colwick parkrun (5K) – a pan-flat, one-lap-and-a-bit route on stony paths and woodland trails around the lakes in Colwick Park. Can be wet and muddy in winter. Gainsborough parkrun (5K) - a hilly, 3-lap route on a mix of rough grass, woodland path and tarmac. Can be wet and muddy in winter. Challenging! Rushcliffe parkrun (5K) – a two-lap course on good quality stone paths in the pretty Rushcliffe Country Park. Gently undulating. Beacon Solstice run (5 miles, June) - mid-summer, Friday evening race on Beacon Hill in the Charnwood Hills. Challenging but very popular - entrues for 2018 sold out almost a year in advance! Belchford 10K (September) - a challenging event over the Lincolnshire Wolds. Hilly, with great views. Part of a larger walking and mountain biking event. The Belchford 10K provides plenty of challenges! Clawson 10K (May) - a hilly, low-key event on the edge of the Vale of Belvoir. the first half is uphill and the second half back down. Highly recommended! The Clawson 10K - simply beautiful! Clumber trail race (10k, June) - summer trail race around the grounds of this stunning National Trust property. Crossdale 10K (September) – a low-key, annual out-and-back race over tracks and trails near the village of Keyworth. Undulating, with a fast downhill start (and a slower uphill finish!) Great atmosphere. Also children’s fun-run. 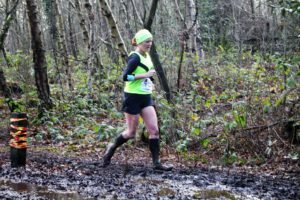 Edwinstowe trail race (10K, December) - pre-Christmas trail race in Sherwood Forest. Very popular so enter well in advance! Goose Fair Gallop (10K, October) - hilly, muddy fun linked to Nottingham's famous annual Goose Fair. 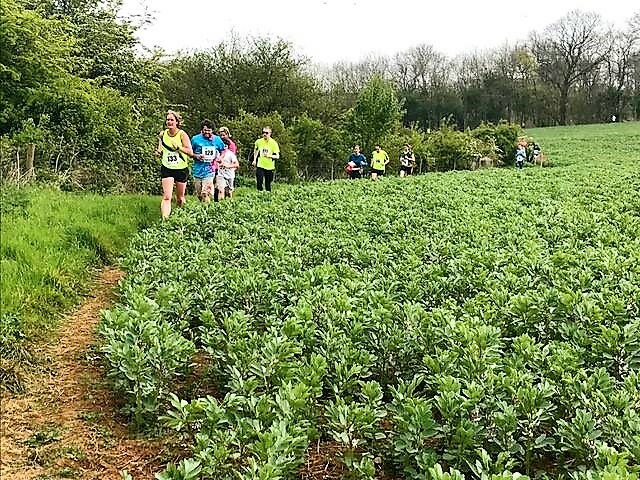 Grantham Cup 10K (April) – a challenging route from the National Trust's Belton House, near Grantham, up onto the Lincolnshire escarpment and back via rough grass and woodland paths. Two steep climbs. Horse lovers will enjoy the Grantham Cup weekend, of which this race is a part. Race memento is frequently a specially-brewed beer. Longhorn 5K (also 10K, half marathon, marathon and 60K ultra) (April) – a lapped flat course on tracks and trails in the grounds of the beautiful Thoresby estate. Unique in that runners of most distances use the same loop, so marathon and ultra-runners mingle with those running the shorter routes. Sherwood Pines trail race (10K, September) - undulating route on tracks and paths through this beautiful section of forest. Skelly 6 (6 miles, May) - new, low-key trail race combining cycle path and woodland paths in and around Skellingthorpe Woods near Lincoln. Syerston Challenge (10K, October) - community-organised race on tracks and trails near Newark. One sharp climb. Great cakes at the finish! 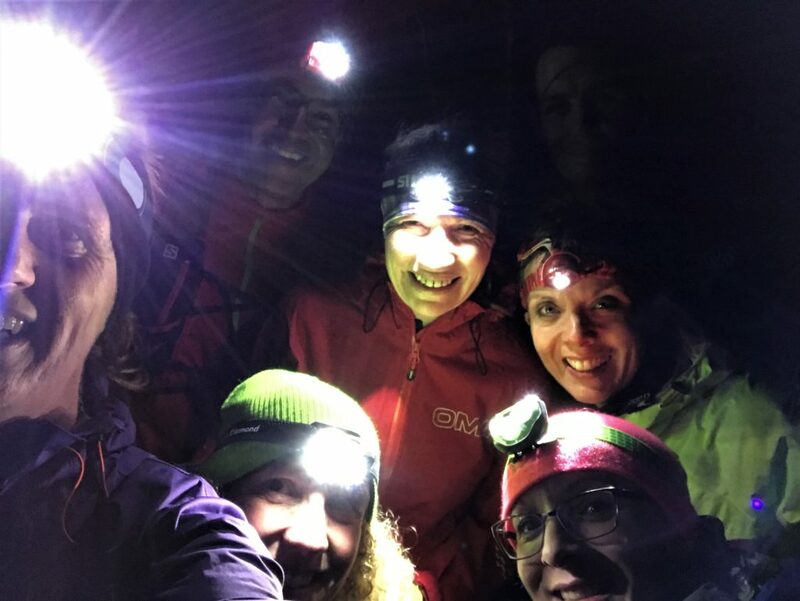 The Night Trail - (5 miles, November) - undulating, Friday night race in the dark. Thoresby 10K (also 5K and 10 miles, October) – a lapped course on tracks and trails in the grounds of the beautiful Thoresby estate in north Nottinghamshire. Can be muddy and wet underfoot. Trust 10 - free National Trust 10K trail race at Clumber Park. Held on the 4th Sunday of every month. Van'Elnor trail run 10K (also 5K, June) - new, low-key trail runs near Marston. Beautiful countryside with the added feature of stepping stones to cross! Bawtry Forest trail race (7 miles, September) - undulating race through this beautiful forest south of Doncaster. Fantastic goody bag. Beacon trail half marathon (October) - tough but beautiful autumn race on Beacon Hill near Leicester. Dukeries 10 (10 miles, February) – low-key but very-well organised flattish route on the Robin Hood Way in north Nottinghamshire. Great atmosphere and personalised race medals add a lovely touch. The Dukeries 10 course - in summer though! Keyworth Trail Run (15K, also 30K, March) – two newish races on tracks and trails in the countryside near Keyworth. Ponton Plod (12 miles, also 17 miles and 27 miles, September) – low-key, well-organised event on the edge of the Vale of Belvoir. Run on tracks, trails and grassy fields. Delicious soup and pudding at finish. Also open to walkers. Spires and Steeples Challenge (13 miles, also 26 miles, October) – long-established off-road run from Lincoln to Sleaford (or Metheringham to Sleaford) along the paths and bridleways of the Arts and Heritage trail. Wheatley 10 (10 miles, December) – an undulating 10 miles around relatively unknown but pretty countryside in north Nottinghamshire. Run on tracks and trails which can be wet and muddy in winter. Great atmosphere and personalised medal at finish. 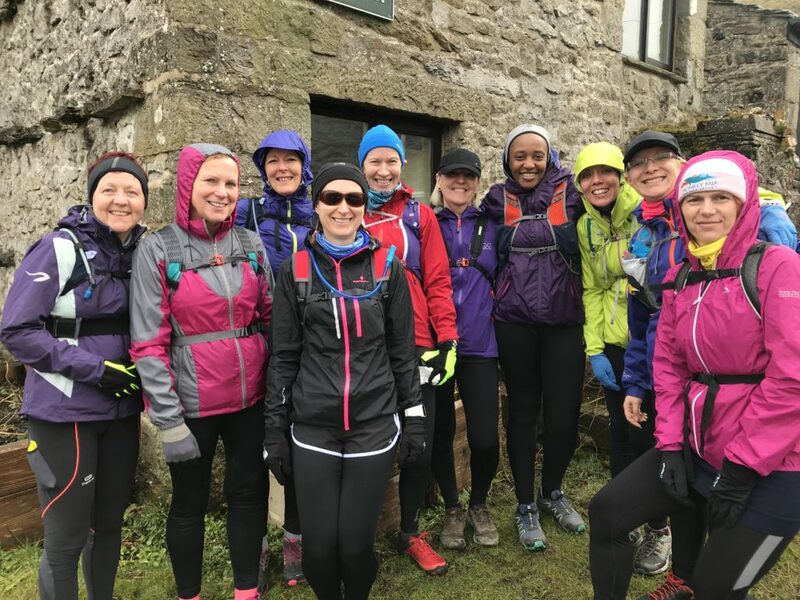 Belvoir Challenge (15 miles, also 26 miles, February) – a long-established event for runners and walkers in the Vale of Belvoir. Hilly and usually very muddy. Excellent range of food provided at the end! Read my 2018 race report here. The Belvoir Challenge - mud, stiles, hills, cake and much more! Woodhouse May Day Challenge (13.5 miles, May) - beautiful mixed-terrain run around Beacon Hill and Bradgate Park near Leicester. Hilly but not too challenging! Dukeries 30 (30 miles, also 40 miles, May) – a low-key but exceptionally well-organised run along the Robin Hood Way through Sherwood Forest and Clumber Park. Generally flat on well-maintained paths and tracks but sections can be wet and muddy. Well-stocked feed stations and encouraging marshalls. Equinox 24 (and 10K, September) - 24-hour race on a 10K loop in the grounds of the iconic Belvoir Castle. Robin Hood 100 (100 miles, September) – this run combines the routes of the Wheatley and Dukeries events above. Viking Way Ultra (147 miles, April) – a non-stop ultra along the Viking Way long-distance footpath. Qualification events required. Not for the feint-hearted. Follow the yellow Viking sign - for 147 miles! Whether you’re new to running, or simply moving across from running on the road, it can be a big step to enter your first trail race. It's easy to find out what trail races are on but to make it as rewarding and enjoyable an experience as possible, it’s worth taking your time to choose carefully. There are so many options available. With a wealth of information out there, use event websites, social media and your running contacts to find out as much as you can. Choose your first trail race with care - make it one to remember! Distances take longer to cover when you are running off-road, so start with a shorter distance than can run on the road. Your pace is most likely to be slower on trails than tarmac and you’ll probably need to walk on uphills or more technical ground. For your first race, pick one that feels manageable to you. Find out all you can about the likely underfoot conditions in a race. Is it on smooth, easy-to-run paths or is the ground more technical? Will it be rocky, muddy or a combination of both? And how much ascent and descent are involved? For your first race, it’s probably best to stick to a less technical course. Look into whether the route will be marked, partly marked or not marked at all. If it’s a self-navigating race, is there a route map provided? Do you have the map-reading skills to find your way, or would you be reliant on following other people? If you're not confident with a map, then choosing a marked course is probably the way to go. Find out how many entrants are usually in the race, as people can become very spread out off-road. It can sometimes be difficult to see other runners, especially in places like forests and on hilly terrain. If you like to be around other people as you run, choose an event with a larger entry list. If you prefer solitude, opt for one with limited numbers. Company or solitude? You decide! Where is the start and the finish? Are they in a remote location or somewhere that’s easy to get to? If the race starts in one place and ends in another, how will you manage with transport? What time of year is the race? Yes, in the UK we can get all sorts of weather at any time of year, but a race in winter is more likely to be cold and wet. For your first race, choosing a season where conditions are more likely to be favourable can be a good idea. Do you have the right kit for the terrain? 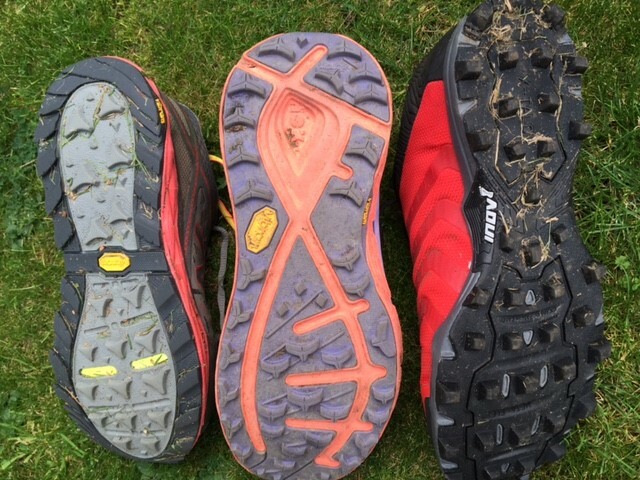 If the route is likely to be very muddy, do your shoes have the right kind of grip? If it's in a mountainous area, is your clothing warm and waterproof enough? Does the race organiser specify a list of compulsory kit to be carried? If so, do you have what is required and the means to carry it? Is the race long enough that you’ll need to eat and drink along the way? If so, find out what, if anything, is provided by the organisers, and where along the route it will be. If you need to carry your own provisions, think about both what you’d need to take and how you would carry it. 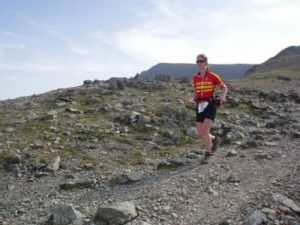 When planning my training and events in the run up to the Lakes Traverse, I had a few key events in mind that I wanted to include. 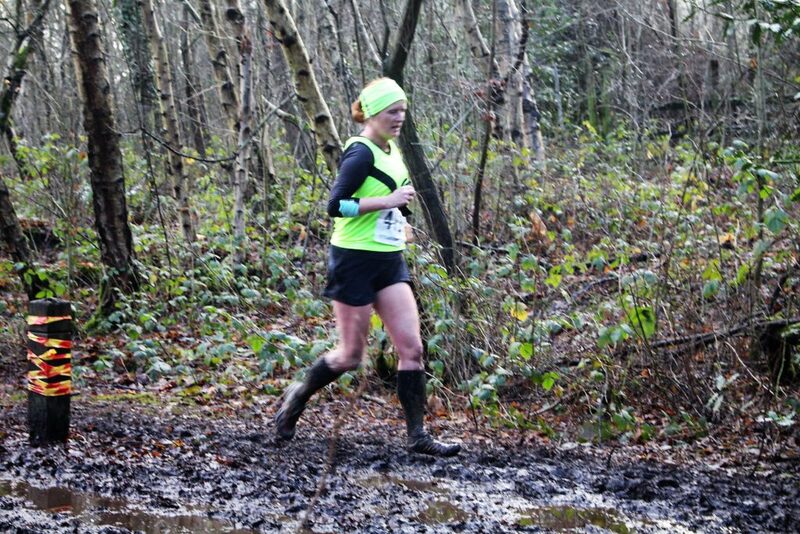 The National Cross-Country championships and the Belvoir Challenge marathon were two of them. When it dawned on me that both were on the same day, a decision had to be made. Should I go with my heart and run again on the muddy, beast of a course that is Parliament Hill? Or should I go with my head and opt for a much longer run, one that would enable me to test out every aspect of my training so far? In the end, head won over heart and so on a very cold February morning, I found myself lined up for the start of my first marathon in a while. To make the ‘testing’ more realistic, I decided to run with the full kit I’ll be carrying in the Lakes. Whilst some were in vest and shorts and carrying nothing, I was laden. In my pack I had 2 litres of water, food for the day, waterproofs, a spare top, first aid kit and bivvi bag. I think the only thing I forgot was my headtorch! What I didn’t do is to run in the shoes I will use for 60 miles, my Hoka Speedgoats. I just didn’t think they’d be grippy enough for the mud, so chose my less cushioned Inov8 Mudclaws instead. One of my weaknesses in a race is that, once I have a number pinned on me, I tend to set off too fast. Having chatted to the several clubmates and clients that were also running, I got into my zone and reminded myself to forget about what everyone else was doing. It helped that almost everyone I knew was doing the 15-mile route and not the 26. Once the race started, I settled into my groove and headed out for what I planned to be around 6 hours. In my head I had broken the route down into the 5 sections between checkpoints; the first was just over 5 miles away. Once out of the village this involved a gradual climb, becoming steeper. The ground was frozen, and the course quite crowded, so it was easy to keep my effort level in check. I relaxed and went with the flow. Going up and over the ridge, I could feel the benefit of all my fast-walk training. I was walking comfortably uphill at the same speed others were running. Dropping down the other side to checkpoint one, there were long queues for a couple of stiles. I just saw it as a chance to rest and enjoy the scenery on what was a stunningly beautiful day. Having plenty of food and drink with me, I ran straight through the first checkpoint without stopping. The course was still quite crowded; I was keen to get to 9 miles, where the routes split. There were some large groups of people trying to run together and I was hoping they were going to take the 15-mile turn. I’ve no problem with people running with a friend, but groups of 8 or 9 on a narrow path? It doesn’t really work. The split soon came and before I knew it I was running through the wooded Belvoir Castle grounds in complete solitude. I could see a couple of guys way ahead, and I knew one was about 100m behind, but that was it. As we climbed up to the top of one of my favourite hills, I felt great. The descent to the next checkpoint was down ‘that’ hill (some of you will know which one I mean from our guided runs!) and I was soon grabbing a quick drink and a slice of cake. I’d started my eating strategy from about an hour into the race. I had my usual ham sandwiches and mini scotch eggs on board. Somehow, I felt I was lacking something, though, and a piece of lemon drizzle did the job. With 12 miles done, I headed onto the flatter but muddier part of the route. Whilst some ground was frozen, the mud was a real challenge in places. I’d get into a great running rhythm across one field, only to enter the next field and find that the consistency of the mud was completely different. Some were gloopy, some bouncy and some sticky like strong glue. It certainly made the 5 miles to the next checkpoint interesting. With the course being so much more open, it was now much easier to see where everyone else was. Despite sticking rigidly to my run/walk/easy effort strategy, I started to pass people. Stopping for the portaloo at checkpoint 3, I even managed to pass some of them twice. I knew that the final climb back onto the ridge would be the toughest. It was the longest climb and was 19 miles into the race. Two weeks previously it had been really slippery in the mud. But the sun was out, the mud had dried up and I felt great all the way up. My fast walking came into its own once again. As I left the final checkpoint at 21 miles (with another piece of lemon drizzle on board!) I knew it was pretty much flat or downhill to the finish. I caught and passed a few walkers from the 15-mile event along the way, plus a few marathon runners too. Having done the shorter event two years ago, I was expecting the last couple of miles across the flatter fields to be a real drag, but they weren’t. I didn’t appreciate the number of stiles, though, but at least they gave my legs a stretch! Before I knew it, I was back at the village hall and crossing the finish line. I’d been pretty spot on with pacing to my planned time. I finished in 6 hours and 10 minutes, but my actual moving time was 5 hours 43. Those stile queues and loo stops had added up! So how did I do against my aims? My race strategy went to plan. I did sneak in a couple of runs on gentler inclines and I did walk a bit on the ‘gluey’ fields but overall it worked well. I kept a really easy effort level all the way round and managed a heart rate average of 135; I’m happy with that. Physically I felt fine all day, absolutely fine. Mentally, the only low point I had was between about miles 7 and 9 where I couldn’t wait for some solitude. My spirit was, of course, helped by the fact it was such a gloriously sunny day. Aside from a few chats with people as we passed, I ran the whole way on my own. And the next day? I managed a very gentle 30-minute run followed by a hilly 6-mile walk, both with very little difficulty. The only discomfort I’ve had is a slightly aching foot. I’m not used to running in Mudclaws over a long distance and I won’t be making that mistake again. Comfort will win over grip! Overall, my day out at the Belvoir Challenge confirms that my training is on the right track. I’m especially pleased with the progress I’ve made in fast walking; it will really help on the big day, I’ve no doubt. What I need next is some mountains in my legs, some big hills, both uphill and down. Trips to the Dales, Lakes and Devon over the coming weeks will sort that. I also need to give some more thought to food. Food during the race that is – I think about food in general a lot! I don’t think I ate enough at Belvoir. I was fine during the event but my hunger levels over the next 24 hours were high, and I was up raiding the fridge at 5am. 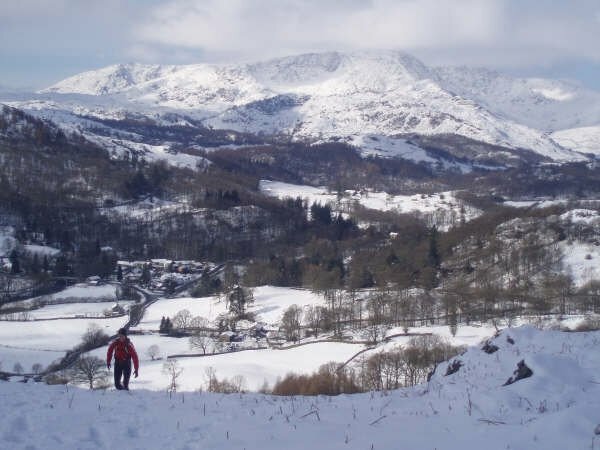 At that time the next day on the Lakes Traverse, I’ll still be running…. Why did I choose to read this? 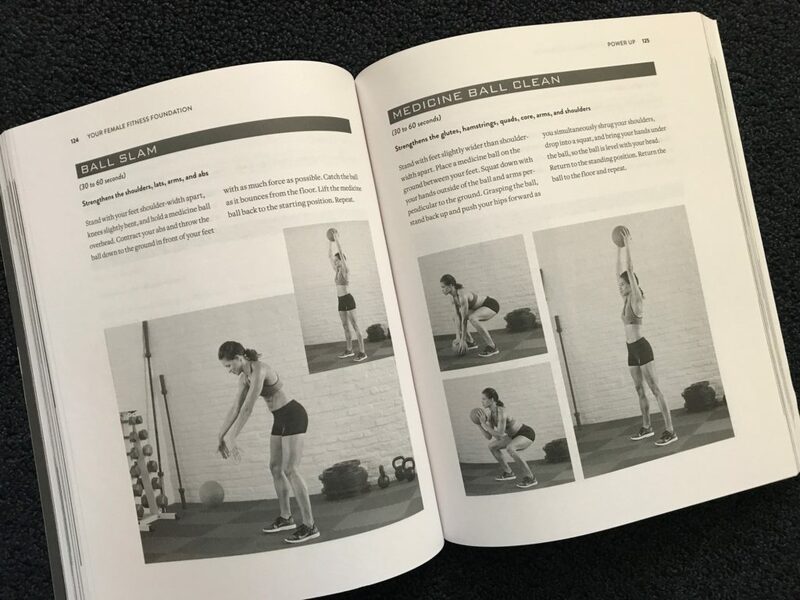 There are so many books out there giving advice on training that I normally choose to read purely those recommended by runners I know. 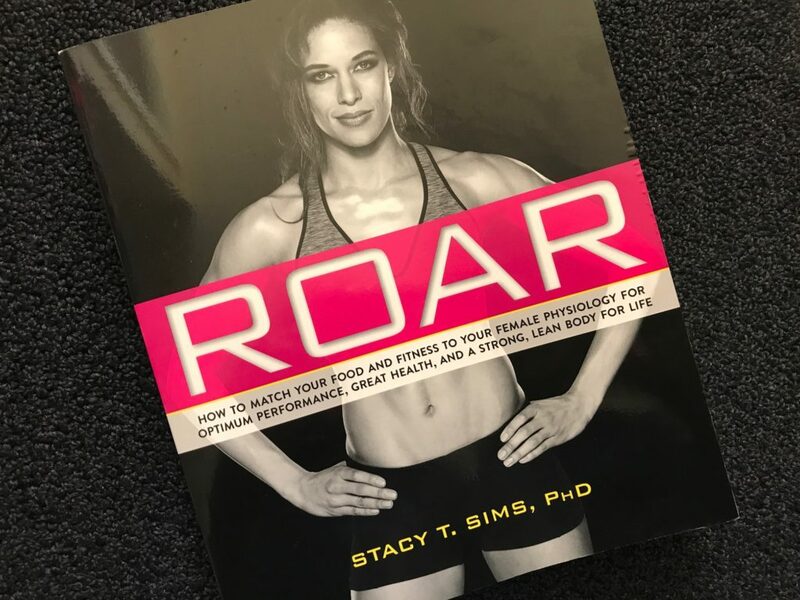 “Roar”, by Stacy T. Sims, however, was a Christmas gift. 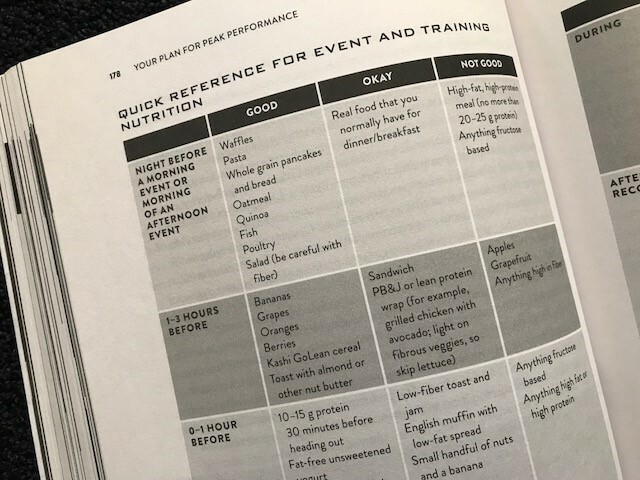 My husband had seen female time-triallists giving it rave reviews on their online forum and thought it might be useful for me, both as a runner and a coach. With a sub-title of "How to match your food and fitness to your female physiology for optimum performance, great health, and a strong, lean body for life", it certainly sounded promising. The introduction nicely summarises in just two short sentences the key message of the book. "You are not a small man. Stop eating and training like one". That’s common sense, surely? Yet how many of us women do train as if we were men? I suspected (knew!) I was guilty and looked forward to reading more. Organised into three clearly defined sections, the book delves initially into "What it means to be a woman on the move". Covering topics such as female versus male physiology, hormones, the menstrual cycle, menopause and pregnancy, Sims talks through the science of these. Most importantly, she explains the potential impact on training and racing. Throughout, she provides practical suggestions as to how to work with your physiology, rather than against it. Weight management, building core strength, stability and power are the focus of part two. Again, there is a useful balance of theory, research and practical ideas. Gut and bone health are also covered. In part three, Sims moves onto to eating; both on a day-to-day basis, as well as eating around and during sport. Useful sample plans give ideas of exactly what to eat in the run up to, during, and after an event. There is also a section on how and when to hydrate. For those seeking to train and race in extreme climates, there’s some specific advice on how to train and prepare as a female. The book finishes with chapters on effective recovery, the use of supplements and training your brain for success. 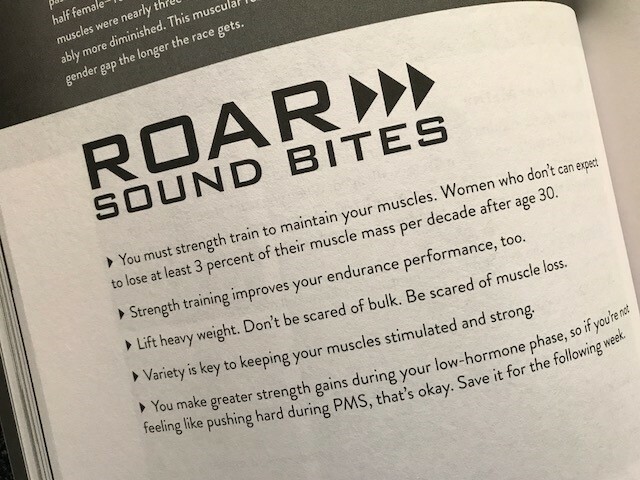 All in all, this is a really useful book for any female athlete or coach. 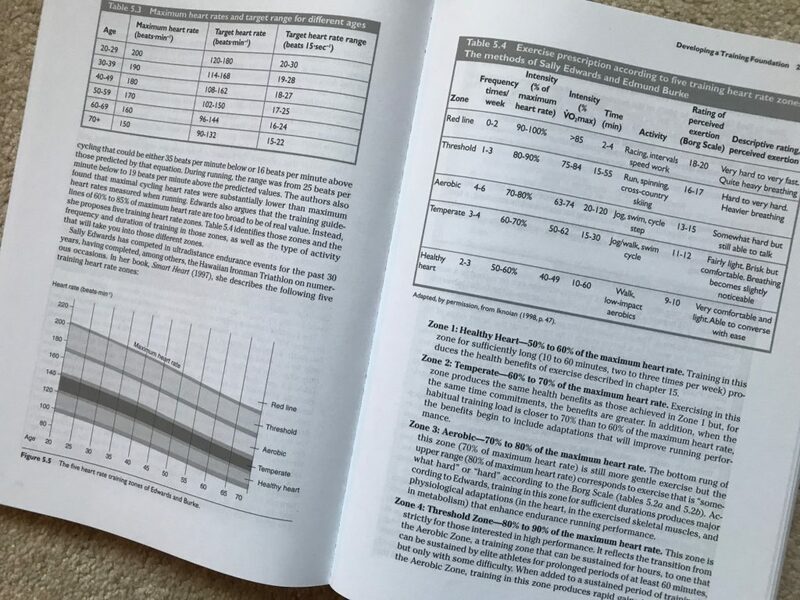 Whilst it’s easy to read, it’s so packed with theory, research and practical ideas that it’s one to dip in and out of. If it has any downsides, it’s that it is, in parts, quite American. Some of the terminology used is slightly different than we use in the UK. The recipes are measured in cups, and there are also some assumptions made that don’t fit with UK regulations. For example, Sims suggests insomniac menopausal athletes might use melatonin. In the US it’s easy to buy; in the UK, it’s prescription-only. These are, however, only slight niggles in what is otherwise a really useful and thought-provoking book. I’ll definitely be using it as a tool to support my own training and when coaching the many women that I do. No matter what you are training for, there usually comes a time when you realise that you are actually on some form of rollercoaster ride. Your direction of travel changes unexpectedly, and fast. There are the ups, where everything is going to plan. You feel great; you're running further and faster and feeling stronger. There are the plateaus, where it all just ticks along nicely. And of course there are the downs, where it feels as though the wheels are starting to come off. Whether it's due to injury, tiredness, loss of motivation, or something else entirely, things feel like they are going wrong. For the first time since I started training for the Lakes Traverse, my rollercoaster took a dive this last weekend. I'd rather run 60 miles than go on a rollercoaster! I was feeling physically great. I'd had a rest week and was raring to go, with a race I'd wanted to do for some time lined up. The Charnwood Hills race is a 14-mile iconic race in Leicestershire, known because it's the only official fell race in the county. I'd run a fair bit of the route before and loved it, and, as I don't race very often, was really looking forward to the event. I knew it would be tough, very tough, but had no worries about meeting their strict cut-off time at 6.5 miles. But perhaps I should have. A combination of very muddy conditions, queues for the many gates and stiles and a brief stop to help someone who had fallen into a ditch slowed me down. At the checkpoint I was surprised to be told that I had missed the cut-off by 3 minutes and could not carry on. Shocked and gutted, I made my way back to the start with another competitor; we moaned and grumbled the whole way! By the time I reached home I'd concluded that I must be the worst runner in the world, and that I must be delusional to think I could run across the Lake District. For 48 hours I wallowed in self-pity. But the downs never last long. The sun was soon out, and after a lovely guided run in the muddy woods, followed by a walk in which I finally managed a sub-14 minute average pace, things were looking up again. Something I've never experienced before is a race briefing held months before the event, so I wasn't quite sure what to expect when Open Adventure invited us all to a webinar last night. What I got was a lot of really practical, useful information. I now know exactly what maps will be provided and what I need to sort myself. I learned exactly which bits of the routes I'll need to recce and which I won't. I found out more about the rules and the food and everything else associated with the event. But most of all, what I got from that hour online was a much-needed mental boost. I came away feeling so, so, excited and ready for an adventure. My rollercoaster is back on an up and whilst I know it won't stay there for the next 13 weeks, it's great to be on top of the world again for now. Running in the Lakes - can't wait for 12th May! If you’ve treated yourself to a new running watch recently, the chances are it came with a heart-rate monitor. 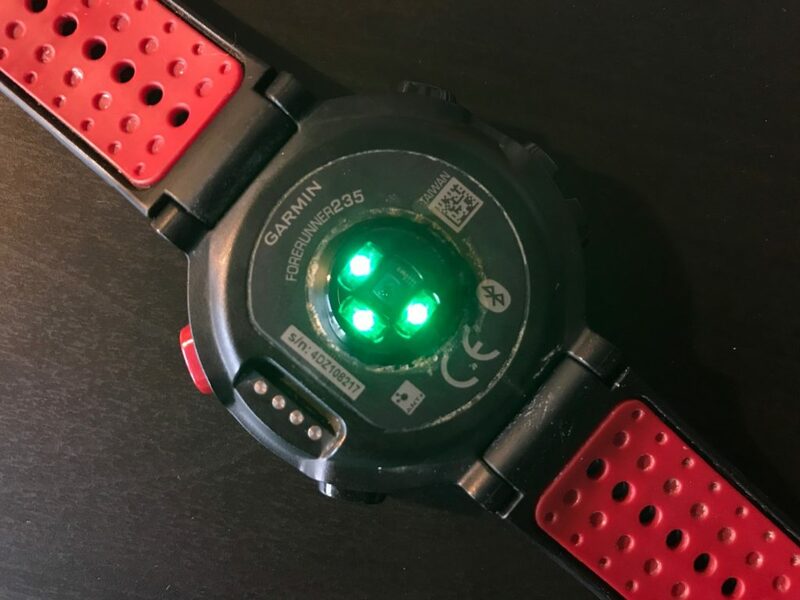 Whether an optical reader on the watch itself, or a strap worn around the chest, the heart-rate monitor is often a rarely used feature. But with a little investment of time, it can become one of the most useful gadgets you own. As heart-rate is a measure of exercise intensity, understanding it and using it can have real training benefits for runners of all abilities and experience. It can help you train at the right intensity for each session so that you recover well and can get the most from future training. Here is how you can get started. Before you even put your heart-rate monitor on, spend some time developing your awareness of how you feel when running. How do you feel when going long and slow? Are you out of breath or can you talk normally? What about if you run at a slightly harder pace? How do you feel when you are working at the hardest effort you can? Building up a picture of how your body feels at different effort levels is key to successful running whether you ever measure your heart-rate in numbers or not. The more you are aware, the better. When you start using your heart-rate monitor, you’ll be able to use the figures to back up what your body is telling you, rather than relying on the technology itself. A self-aware runner is what you should aspire to be! In order to get the most from measuring your heart-rate, you’ll need to establish some baselines. Firstly, you’ll need to know what your resting heart-rate is. This is how many times per minute your heart beats when your body has been at rest, so is best measured first thing in the morning. Do it before you get out of bed. Wearing your monitor overnight and looking as soon as you wake up works well. At the other end of the spectrum, you also need to know your maximum heart-rate; how many beats per minute your heart makes when your body is working as hard as it possibly can. Ask Google and you will find many formulae for working this out, but these are often no more than a rough guide. It is more effective to find out your actual rate through some hard activity. One way is to do a thorough warm up, then run as hard as you possibly can for three minutes. Jog or walk for two minutes as recovery, and then run as hard as you can for another three minutes before cooling down. Your maximum heart-rate will be the highest reading that you get during the second hard run. Once you’ve worked your figures out, it’s time to see how they relate to your actual running. Over a few weeks, try a variety of runs – some slower and easier, some hard and fast, and some in the middle. Think first about how you feel and then take a look at what your heart-rate monitor tells you. If your easy run feels really easy, what does the monitor say? Does it confirm you are within the right zone? Does it suggest you are running too hard? What about at a deliberately hard effort? Is your heart rate within the suggested zone, or are you perhaps not running hard enough? Once you’ve developed a really good awareness of how you feel when you run, and what your heart monitor tells you, you’ll create a picture of what’s normal for you. When running feels really easy, you’ll have a pretty good idea what kind of figure your heart-rate monitor will show. If you’re racing for a 5K PB, again you’ll know what range of beats per minute to expect to see. It takes time, but your heart-rate monitor will become a check for you. It will confirm, or otherwise, what you already know. The sensors on a monitor are not always accurate, especially optical wrist ones. Sometimes just having the strap too tight or being extra sweaty can result in figures that are far from your normal. Look out for these and learn to recognise when they happen. Sometimes you’ll just know it’s not you, it’s the monitor! Once you’re aware of how you feel running at different effort levels and how the figures from your heart-rate monitor relate, use it. Experiment with training plans based on heart-rate or effort rather than pace, using your knowledge to keep broadly within the right training zones. If you wake up feeling out of sorts, use what you know to decide whether you should be running at all. Whatever you do, though, don’t become a slave to your watch. Go first with how you feel and use the data as a back-up if you need to - you'll enjoy your running much more that way.